I tried to set up conditions but only part of the condition was working so I thought I removed them to start over. Now, one of my images is missing and I can't figure out how to get the image to show up in the form builder, short of adding it in place of the huge blank placeholder that currently displays in the builder. Also, I can't seem to get the "conditions" button to work. I've checked your JotForm and it displays the broken image in the form. As I check the URL of the image, it seems that the image is deleted or using an incorrect filename. 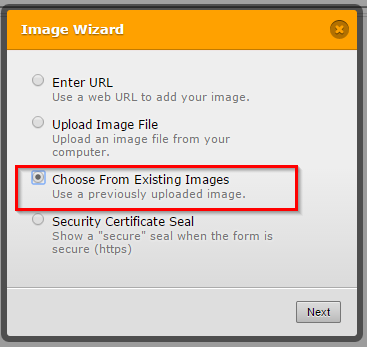 If you have already uploaded the image to JotForm, the image is still accessible from the Image wizard. You can choose the uploaded image by selecting Choose from Existing Images. If the image is not available in the existing images, you may need to re-upload the image again. Please try clearing the browser cache to see if that helps in accessing Conditions button. Let us know if the issue still persists. We will be happy to look into this issue further.